My garage full of ‘stuff’. 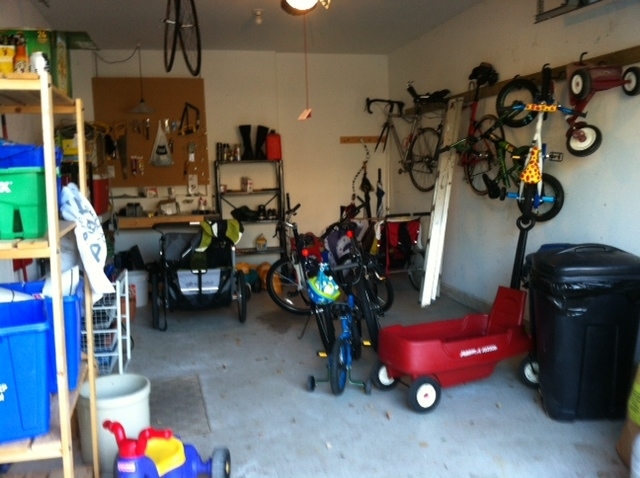 I have seven bikes in my garage (four adult, three kid). And two tricycles. And a ride-on toy. And two running strollers. And a double stroller. And an umbrella stroller. And a wagon. There is no room for a car (we’re driveway-parkers) because we have too much ‘stuff’. Yet I am not someone who places a high value on ‘stuff’. We have a car that’s rusty, couches that are well-worn, and I don’t care if I’m wearing Name Brands or Joe Fresh. But somehow I have fallen into the trap of excess. I’m trying to word this properly, because I don’t want to come off as self-righteous and complain about having this First-World problem. Don’t get me wrong, I feel very fortunate to have all of these possessions. But I’m trying to wrap my head around the difference between the amount of ‘stuff’ I need versus the amount of ‘stuff’ I want versus the amount of ‘stuff’ I have. We (I am referring to the ‘Royal We’, which sometimes includes me and sometimes doesn’t) live in a society of excess, a society of materialism, and a society of ‘stuff’. We put in extra hours at work to pay for ‘stuff’ we can’t afford, and we don’t have time to enjoy the ‘stuff’ with the people that we love. Isn’t that ironic? Aren’t our priorities skewed? Out of all the blessings in my life, the thing that I value most is time with my family. Priority one. So I am going to uncomplicate my life a bit by getting rid of some ‘stuff’. I think I’ll start with the garage. Thirty years ago my busy friend, I was you. Yeah, I was superman, not what does it matter. Son, don’t miss your life. My daughter called, she made straight A’s and they’re off to celebrate. My daughter with her mom and friends, not a single one with me. The truth is half the time, I’m not even there. Saturday’s her eighth birthday and I’m not gonna miss it. Bawling!! Truly. I hear everything you are saying Ash. “Keeping up with the Joneses” is something that doesn’t interest us at all either. Don’t get me wrong, there is some stuff (ok, lots!) I would LOVE to have. But the things we need to do in order to get that stuff we are not willing to do. We like being “minimalists”. We have a sense of pride in it. Thanks for the feedback Ange! I know you can relate!